What Has Steve Jobs Wrought? [First published October 12, 2012] Steve Jobs had an insanely great ride on the waves of digitization that have transformed the way we work and play over the last few decades. But taking a cursory look at the hundreds of tributes published to commemorate the anniversary of his passing, I was surprised to find lots of trees but not a single forest. The pig picture view of Jobs’ life is sorely missing. We hear about a lot of specific things that he did or stimulated: He was “a genius toymaker,” a “genuine human being,” a “patent warrior.” He invented this, pushed for that, and denounced the other thing. All true. But wasn’t there something bigger that connected all the dots besides his creativity and drive? This was the big picture Jobs was so good at? “Revolutionizing” or “traumatizing” a number of industries? Maybe. It’s possible that the only thing that drove him was the desire to play the rebel, toppling the established order one industry domino after the other. But maybe there was an even bigger arc to his vision. Maybe he revolutionized industries because he saw a world without them, because he understood what digitization has wrought. “What has God wrought” was the first message sent by telegraph and with it Samuel Morse had launched the Electronic Century. This was the pre-history of digitization, using electronic means to alter our previous notions of time and space and to provide new means of delivering news, information, and entertainment. It has spawned a number of industries (telegraph, telephone, radio, TV, film, recorded sound and music) and vast academic empires in economics and anti-trust law. Based on distinct analog technologies, the pre-digital era trained everybody—in government, business, academia, the press—to perceive the economy as divided along the lines of “industry” segments and to hold the entrenched belief that each industry has unique “competitive forces” and requires unique skills and experience. Steve Jobs, the rebel that he was, ignored the rigidity and perceived boundaries of “industries” and instead has bet on the digitization of all industries producing and transmitting content: publishing, film, music, radio, TV… Especially after he came back to Apple in 1997, at the time when the invention of another rebel, Tim Berners-Lee, has taken the world by storm. The Web (not “the Internet”) was the glue and the catalyst that would speed up the spread of digitization to all analog devices and channels for the creation, communications, and consumption of information. The waves of digitization sweeping all these industries, the shift from analog to digital, was Steve Jobs’ big picture and he rode each wave successfully. In 2002, digital storage surpassed non-digital storage for the first time, according to Martin Hilbert and Priscila Lopez. By 2007, 94% of storage capacity in the world was digital, a complete reversal from 1986, when 99.2% of all storage capacity was analog. On January 9, 2007, Jobs announced that Apple Computer, Inc. would from that point on be known as Apple Inc., because computers were no longer the main focus of the company. Jobs has created a company (which became the most valuable company in the world five years later) that did not fit anymore into any specific “industry” pigeonhole. Jobs is gone but digitization continues its relentless march. The current wave is all about “things”—your car, house, electrical grid, even cows. And companies like FedEx and P&G and GE are leading indicators for the next big digitization wave: All businesses will be digitized. Bezos is bothered by waste the same way Steve Jobs was bothered by lack of imagination or bad aesthetics. 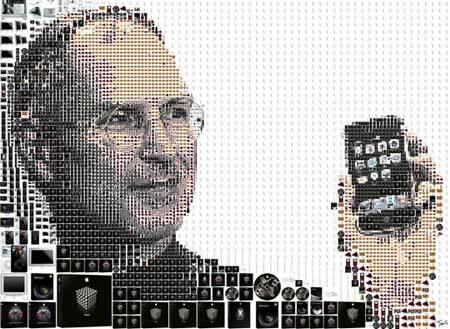 Product design was the core of Steve Jobs’ strategy to ride the digitization waves. Delivery, the speed of delivery, is the core of Bezos’. Jobs has applied the same design principles across a range of previously separate and distinct devices; Bezos is applying the same management principles across a range of previously separate and distinct business activities. Bezos, channeling the big wave of digitization which has destroyed “industry” boundaries, sees the big picture of analog turning into 1s and 0s, successive waves of big data that helps apply the same principles to selling goods, to offering services, to storing, discovering and consuming information, to coordinating work and leisure, to creating content. This entry was posted in Apple, Digitization, This day in information. Bookmark the permalink.